He was a Distinguished Visiting fellow under UK Royal Academy of Engineering at University of Cambridge and has served as Faculty/Staff at IBM Research, Eindhoven University, State University of Utrecht, Penn-State, UIUC, UCSD, IRISA, INRIA, CWI, Max Planck Institute etc. 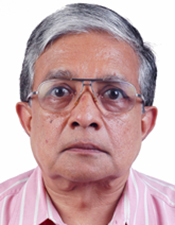 He serves on the Governing Councils of IIIT Allahabad and Jabalpur, CSIR-CMMACS Bangalore, and serves on the Technical Advisory Board of Bombay Stock Exchange, and IDRBT etc. He is also a Fellow of CSI, IETE and its Diamond Jubilee medal awardee. He is a Fellow of Indian Academy of Sciences, Indian National Science Academy, National Academy of Sciences, National Academy of Engineering, India. He is a Fellow of the Academy of Sciences of the Developing world (TWAS), Trieste, Italy.